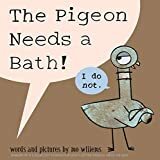 Staff Pick - The Pigeon Needs a Bath! The Pigeon really needs a bath! Except, the Pigeon's not so sure about that. Besides, he took a bath last month! Maybe. It's going to take some serious convincing to try and get the Pigeon to take the plunge.